Brookside Farms started in beautiful British Columbia's Fraser Valley. They developed patented technology to create the ultimate chocolate experience; Soft, sweetened fruit flavoured centers from classic favourites and unique taste sensations. I have tried Brookside chocolates before. The exotic fruit flavoured centers are a guilty pleasure and the crunchy clusters provide so many flavours and textures that I simply love it! Brookside Chocolate Tablet Bars are just as delightful. I love the packaging - it comes wrapped in foil, coloured of their respective flavour and the chocolate itself is very design-detailed (pictured above), almost too good to eat. I love the richness of the dark chocolate infused with the blueberry and acai. The almonds balanced out the sweet richness of the chocolate. 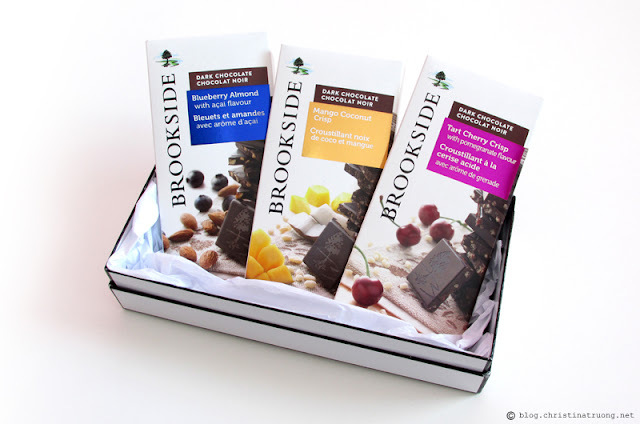 I already love Brookside's exotic fruit flavour chocolate in açaí and blueberry and I also love my chocolate covered almonds, so this was a match made in chocolate heaven. When I first opened the package the smell, smelled beautiful, almost reminds me of The Body Shop's Mango body butter. The chocolate itself tasted like a sweetened mango but you can also really taste the richness of the dark chocolate. To top everything off, you can really get the hints of coconut shavings and crisp. The Tart Cherry Crisp with Pomegranate taste delicious! The moment I opened the package, it instantly smells like cherry chocolate. I'm usually not a fan of those cherry chocolates with the gooey cherry centers so I never get the chance to really enjoy what smells so amazing. The chocolate doesn't have any gooey centers (thankfully), you can definitely taste a tart cherry with dark chocolate plus a tiny hint of pomegranate. The crisp adds that extra texture that works well with the cherry chocolate combination. Overall, the goodness coming from the ingredients combined with rich dark chocolate is a two thumbs up for me. Rich quality dark chocolate in three different flavours, there's something for everyone and for under $4 each, how can you say no? It's the perfect add-on gift or as itself for those who love chocolate with fruits and nuts. What are your thoughts on the Brookside Chocolate Tablet Bars? Have you tried anything from Brookside before? Do you have a favourite flavour? Leave me a comment below or Tweet me @truongchristina.